SatTrackCam Leiden (b)log: Another bright flare of Lacrosse 4 - imaged this time! 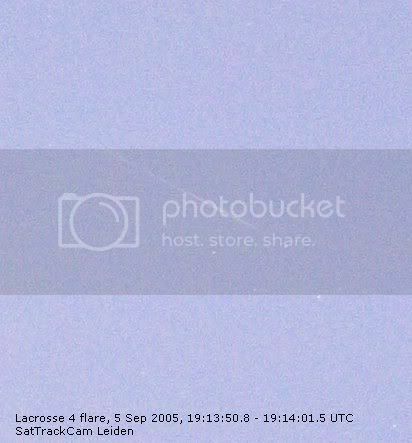 Another bright flare of Lacrosse 4 - imaged this time! During its deep twilight pass of 19:14 UTC (21:14 local time) Lacrosse 4 (00-047A, # 26473) showed a bright Iridium-like flare, just like two days ago. The sky was still bright blue with only the brighter stars visible. Yet Lacrosse 4 stood out well for severall seconds. I estimate it reached at least magnitude 0. This time, the camera was open when it happened. Nothwithstanding a light blue brackground, the flare is well-visible on the image. Stars from delphinus can be recognized at lower right.